The students I teach are mostly business people who work long hours and until late, so they don’t have the time or energy to practise outside the classroom. This is a significant problem because if they don’t put their language skills into practice regularly then they will forget what they have learned in class and will not improve as quickly as they would like (especially if they are preparing for an exam). At the language academy where I teach in Madrid, there is a “2 hour method”, where the students will do a 40 minute listening exercise, followed by a 40 minute speaking class and a 40 minute writing exercise. Although this covers all of the language skills (reading, writing, listening and speaking), the structure is very impersonal and doesn’t allow students to focus on their skill that requires the most attention or their preferred learning type. That is why creating an out-of-class English club with the purpose of catering to all learning types (aural, visual, verbal and kinaesthetic) would combat this problem and encourage busy working students to practise in their limited free time. Monthly schedule: 4 activities rotating every week so they are running once a month. Students are welcome to attend the club every week or may just choose an activity that suits their learning type. Week 1: an English movie night for visual learners, suitable for A1 – C2 learners as there would be Spanish subtitles. Hire out a small venue with a projection screen, bean bags, blankets and popcorn to create a cosy and intimate atmosphere; allow students to socialise for half an hour before starting the film; play a British English movie (to help consolidate vocabulary from class) with Spanish subtitles. According to Kristina Ericksen from Collegis Education, visual learners are “good with remembering faces”, and their “notes are covered with drawings”, emphasising their need for imagery when learning. Watching a movie would be suitable because this activity involves engaging the brain with the target language, moving pictures and colour. Week 2: an English karaoke night for aural leaners. Hire out a karaoke bar and encourage students to sing songs in English while socialising with other EFL learners. Ericksen states that aural learners are “good listeners” and “have difficulty working quietly for long periods of time”. Therefore, karaoke would be a fun way for them to interact with music and sound in a relaxed environment. Week 3: an interactive English food demonstration. Hire out a commercial kitchen and bring in a British chef to demonstrate cooking some classic British food dishes; students would then be able to work together to recreate the same dishes and enjoy their freshly prepared dinner; this would work well in Madrid because it’s a cultural norm here for people to eat late in the evening. Ericksen notes that kinaesthetic learners “enjoy building, making or creating” and suggests that they should use “flashcards, games or activities to study”. They have a need to use their body and sense of touch, so I believe that a cooking activity would animate these learners to do something active, creative, and learn English at the same time. Week 4: an English book club for verbal learners, suitable for C1 and C2 students only. A more advanced and exclusive get-together for literature lovers. Students would read a novel by a British author each month and then come together to discuss the book in English, in a group led by an English literature teacher. Ericksen points out that verbal learners “enjoy reading and writing” and should “seek resources in articles, e-books and essays”. As a result, reading English books and discussing them in a group setting would be stimulating for these learners. 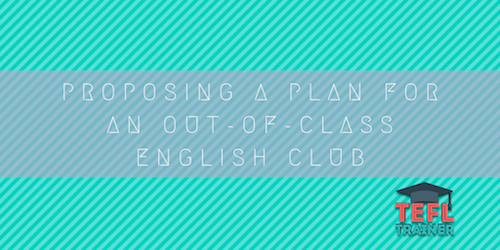 In conclusion, setting up an out-of-class English club would be beneficial for my students because it would give them an opportunity to meet like-minded EFL students, socialise and unwind after a busy day at work, and it would stimulate them in a way that would motivate them in their learning. It would also benefit me as their teacher, as I would be able to learn more about my students based on which activities they enjoy at the club, therefore allowing me to find ways to tailor their lessons to cater for their learning preferences.